Delta joined the Port of Seattle for a celebration on Tuesday at Seattle-Tacoma International Airport marking the latest milestone in the construction of the new international arrivals facility. The Port raised and put into place the final structural roof beam, "topping off" the main structure of the facility expected to open in 2020. 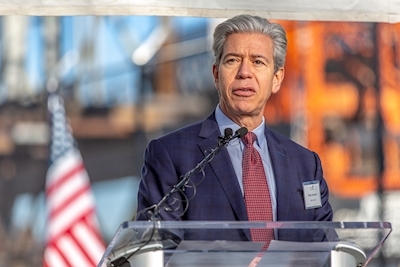 Tony Gonchar, Delta's Vice President – Seattle, joined the Port at the ceremony. "Like other stakeholders in the Puget Sound region, Delta long ago saw the potential for Sea-Tac to expand its reach and become a truly world-class international gateway," said Tony. "Today's milestone brings us closer to that vision. As Seattle's largest global airline and the largest future user of this facility, we know our customers and this region are ready for the benefits to come." The new, 450,000-square-foot facility, located to the east of the current Concourse A, will feature baggage claim and customs processing areas, an 85-foot-high aerial walkway that will create a connection to the South Satellite, and a new security corridor that will allow dual use of gates on Concourse A for international and domestic arriving flights. It will be able to serve 2,600 passengers per hour and will double the number of gates capable of handling international wide-body aircraft. The facility will also have more than twice the number of passport check positions and will incorporate enhanced technologies for faster passport check clearance. It will also simplify the baggage claim process for customers. The current, 1970s-era facility was originally designed to serve 1,200 passengers per hour and no longer meets demand as the local economy and traffic at Sea-Tac continues to grow. More information on the new facility is available on the Port of Seattle's website. The international arrivals facility project at Sea-Tac is one of several infrastructure projects in the works at Delta hubs around the system. 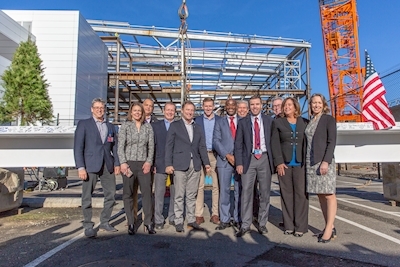 Delta also recently celebrated the "topping off" of the first of four new concourses that will comprise the $3.9 billion new terminal at New York's LaGuardia Airport. The airline also recently kicked off the $1.86 billion Delta Sky Way at LAX project in Los Angeles, which will modernize and upgrade Terminals 2 and 3 and later connect them to the Tom Bradley International Terminal. In Salt Lake City, construction on a $3.6 billion airport overhaul continues, with a new main airport terminal scheduled to open in 2020. Delta is Seattle's largest global airline with 150 peak-day departures to 50 destinations. The airline continues to grow its presence in the market and this summer offered 10 percent more peak-day seats, driven by the addition of three new domestic destinations — Indianapolis, Kansas City and Washington-Dulles — as well as more flights and larger aircraft operating existing routes.